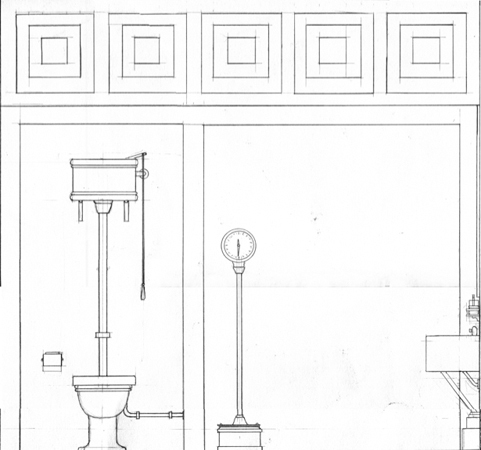 Lucy McKenzie, Fascist Bathroom (View WC), 2012. Pencil on paper. For her first solo exhibition in Belgium the Scottish artist Lucy McKenzie presents new paintings comprising several series dealing with different aspects of how an artist processes and transforms source material, and the problems of relying on distance or ambiguity with one’s chosen sources. McKenzie’s work is expressed in many forms including painting, exhibition organization, writing, commercial design and illustration. Underpinning this pluralism is a desire to form new associations, where both appropriated and self-generated material combine to create a vision which is personal and critical of contemporary orthodoxies. 50 Shades takes its title from the E.L. James novel 50 Shades of Grey, a publishing phenomenon symbolic of women’s success within the field of commercial genre writing as opposed to ‘literature.’ Another figure referenced within the exhibition is bestselling crime writer Agatha Christie. The paintings on show depict in meticulous trompe l’oeil research into several themes; themes never intended to be realized into fully formed works because of their subject matters, which the artist deems inappropriate for exhibition because of their controversial natures. They deal with two areas closely tied to aesthetics; misogyny and the politics of the far right, and their treatment reveals something of how vagueness is used as a tool to avoid accountability when dealing with material likely to offend. This is particularly true when relating to subculture, in honor of which she will create a ‘Fascist Bathroom’ after the anthology of writing on post punk by Greil Marcus’ In the Fascist Bathroom. Lucy McKenzie was born in Glasgow, Scotland in 1977. She studied at the Duncan of Jordanstone College of Art and Design in Dundee, and has recently completed a further qualification focused on traditional art techniques at the Institut Supérieur de Peinture Van der Kelen-Logelain, a college of illusion painting and decoration in Brussels. Her myriad activities constantly exceed the narrow confines of visual art, be it through her involvement in social projects, such as the Nova Popularna speakeasy/artist salon in Warsaw (with Paulina Olowska), the Charisma gallery (with Keith Farquhar), or the record label Decemberism. Together with fashion designer Beca Lipscombe and illustrator Bernie Reid (both from Edinburgh), in 2007 she founded Atelier, a company that carries out design projects for public and semi-private spaces with a particular emphasis on applied arts and artisan techniques. Her work has been shown in museums worldwide, such Museum Ludwig, Cologne (2010), Museum of Modern Art, New York (2008), Van Abbemuseum, Eindhoven (2004). In 2013, a new solo exhibition will open at Stedelijk Museum, Amsterdam. McKenzie currently lives and works in Brussels.